Inside of the removable cockpit hatch on this electric RC powerboat is an electronic speed control which provides variable speed and power while the metal propeller and rudder offer sharp handling and durability. Measures 20.7 inches long and reach speeds of about 20 MPH! Still want more? Buy today and receive a rechargeable battery pack and wall charger at no additional charge. 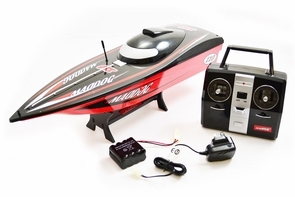 Order up to 6 RC boats as you can race with your friends without interference with the new 2.4G remote control and receiver that we added to this amazing Mad Dog Racing Boat.Yes, this RC boat will also work in saltwater. Just run freshwater through the boat after you are done playing with it. Dimensions: Length 20.7" Width 6" Height 5 "